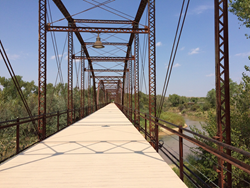 The Texas Panhandle's Canadian River Wagon Bridge features durable and attractive MoistureShield composite decking from AERT. Starting with Spanish explorer Francisco Coronado’s search for the legendary Seven Cities of Cibola in the 1500s, travelers have been traversing Texas’ Canadian River in search of fortune for centuries. In a region rich with history, MoistureShield composite decking is poised to take its place in history on the Canadian River Wagon Bridge in the Texas Panhandle, following its first year of exposure to the demanding Texas climate. In 1916, the Austin Bridge Company of Dallas commissioned the 3,255-foot truss bridge across the river for wagon traffic to serve the growing region. It was replaced in 1953 by a more modern automobile bridge, and then upgraded again in 2000 when Hemphill County converted the picturesque, old wagon bridge to be used by pedestrians and bicyclists. In October, 2015, county officials rededicated the bridge after replacing its old, damaged wooden planks with durable and attractive MoistureShield composite decking designed to last decades longer than traditional wood decking. The Texas State Historical Association (TSHA) describes the Canadian River Wagon Bridge as “the focal point for a scenic hike-and-bike trail” and “a platform for viewing wildlife, including white-tailed deer, wild turkey and waterfowl.” Hemphill County Judge George Briant called the bridge “a legend and legacy here in this community,” according to the Canadian Record newspaper. Visitors can find the bridge two miles north of Canadian, Texas, on U.S. 60/83. With its warranty against rot, decay and termite damage, the MoistureShield composite decking will help north Texas residents and visitors enjoy the Canadian River Wagon Bridge for many decades to come. MoistureShield composite decking and railing offers the solution for every commercial and residential decking need with its range of attractive colors, realistic embossed wood grain patterns and grooved boards to accommodate hidden fasteners. Because of a unique manufacturing process, each MoistureShield board is protected to the core, and is backed by the industry’s leading lifetime warranty. With 95% total recycled content, MoistureShield composite decking and railing is also an environmentally responsible choice, helping prevent discarded plastics from ending up in landfills. For more information visit moistureshield.com or call (866) 729-2378.